Tennessee Early Intervention System (TEIS) and the Memphis Delta Interagency Coordinating Council (MDICC) are hosting a FREE Parent Luncheon for parents with young children who have special needs. The Luncheon will be held at Benjamin Hooks Central Library. TEIS works with children birth to three and the MDICC is comprised of Early Intervention Agencies, Rehabilitation Agencies, local school systems, Head Start, and various community agencies. Their goal is to assess the availability and access to services for these families, and to increase public awareness about Early Intervention and services offered through the schools and Head Starts in Memphis, Shelby, Fayette, Tipton and Lauderdale counties. The guest speaker will be Julie Coffey from the Shelby County Office of Early Childhood and Youth. Everyone is welcome to attend. Please RSVP to Gretchen Dickerson at 901-287-4503. This workshop will help parents who are in the process of choosing a preschool for their child. This is a panel led discussion, which will include a parent, school system specialist, and private preschool director. There is no charge for this workshop but you must register by contacting the DSAM office at (901) 547-7588. This free session open to all parents and family members. For more info, please call Annette Vaughan (901) 416-0161. Join The Arc of the Mid-South at Memphis City Hall as the City Council signs a proclamation to kick-off National Disability Awareness Month. Contact Jennifer Buchanan at (901) 327-2473 or here for more information. Sibshops are for children ages 7-12 years old who have a brother or sister with developmental disabilities and special health needs. Sibshops provide opportunities to obtain peer support and education by interspersing discussion and sharing with high-energy games, crafts, and fun activities that give kids a chance to build new friendships and find support in a recreational context! Pizza dinner provided. Cost is $10 per child per session. Scholarships are available. For more info or registration, please contact Jennifer Washburn here or (901) 448-6670. Sponsored by: The Harwood Center Inc., Hope Presbyterian Church, and The UT Boling Center for Developmental Disabilities. ATTENTION TEACHERS! The Arc of the Mid-South’s Career Development program will host a three-day workshop at Anointed Temple of Praise to provide job readiness training for students with disabilities. If you are interested in participating, contact Jennifer Buchanan at 901-327-2473 or here for more information. Pizza and Karaoke Party with Own Our Own and The Exceptional Foundation @ The Exceptional Foundation. The Exceptional Foundation is located at 1780 Moriah Woods Boulevard, Suite 4, Memphis, TN 38117. Questions about weekend events and/or The Exceptional Foundation, please contact (901)-387-5002. Teams from city and county government, local businesses and other supporters will come together to play wheelchair basketball in honor of Disability Awareness Month. There will also be an information fair to showcase other organizations that offer services to those with disabilities. The events will be held at Mississippi Boulevard Christian Church. If you would like to enter a team in the tournament, contact Ruth Kirby at The Arc of the Mid-South (901) 507-8569 or here. Check out http://www.aaidd.org/content_1523.cfm for more information. * Registration is now open for the Inaugural Tennessee Adult Brothers and Sisters (TABS) Conference. Topics covered will include Future Planning, Caring for the Caregiver, Legislation & Advocacy, Family Dynamics & Relationships, and Research. The Conference will take place April 3-4, 2009 in Nashville, Tennessee at the Holiday Inn Select at Vanderbilt. The conference fee is $45, which includes registration fee, a conference t-shirt, meals, and conference materials. For more information on the conference and to register, click here or call (615) 322-8529 x15. Please register by March 3, 2009. * On Thursday, April 30, 2009, the State Board of Education will hold a rulemaking hearing regarding the proposed rule regarding restraint and isolation of students receiving special education services. The hearing will be from 10 - 11 a.m. CDT, at 710 James Robertson Pkwy, 1st Floor Conf. Rm., Andrew Johnson Tower,Nashville TN 37243. * The Tennessee Council on Developmental Disabilities is preparing to host its 9th annual Youth Leadership Forum, June 29-July 2, 2009, on Vanderbilt University's campus. They are seeking high school students with disabilities - rising 10th graders through those who will graduate in 2009 - to participate in a four-day advocacy and leadership training program. During the course of the four days, students will attend sessions on leadership, employment, community involvement and college resources for students with disabilities. The deadline for submissions is February 27, 2009. Only fully completed applications will be considered. For more information, please contact Ned Andrew Solomon, Director, Tennessee Youth Leadership Forum, 615-532-6556 or here. * The Arc of Tennessee's Secondary Transition Project announces openings for workshops across the state this Spring. It's never too early or too late to begin planning your child's transition from school to adult life, but by the time s/he is 14, the formal planning should be under way. This can be a confusing and scary process for parents who have worked to protect their children with disabilities. For more information about the Secondary Transition Project, visit The Arc of Tennessee's Website. Please note that the NEW Secondary Transition Family Handbook is available at a button near the bottom of the page. To schedule a workshop near you, contact either Treva Maitland here or by phone (731) 559-4187, or Loria Richardson here or phone (615) 215-2065. * The Exceptional Foundation of West Tennessee will be opening their doors Monday, March 2nd @ 8:00a.m!! Please call 901-387-5003 to set up an appointment if you would like to view the facilities with your loved one and talk with the staff. We welcome appointments at any time, so do not hesitate to call! The Exceptional Foundation is a non-profit organization, serving mentally challenged individuals of all ages in Memphis and Shelby County by targeting social and recreational objectives. The Exceptional Foundation gives our participants the opportunity to attend various field trips, the possibility of competing in sporting activities, and the chance to socialize and meet new people in supportive settings. We had a great time in Nashville yesterday at Disability Days on the Hill. We were just one of several organizations that work with individuals with disabilities there meeting with our legislators, discussing important issues to the disability community. You’d be hard-pressed to find someone who didn’t have a good time and feel that it was time well-spent. Our main focus fell on two issues: The Open Doors Home Health Care Act and preserving the Family Support Program. The Open Doors Home Health Care Act (Senate Bill 851/House Bill 1114) is a simple 1-page bill that would remove the 2008 TennCare restrictions on home health care and re-open doors to the community. The current rules generally forbid home health care aides and private duty nurses from leaving an individual’s home while providing services to them. These rules prevent them from taking their clients to church, classes, work, community activities, or even a doctor’s appointment, effectively isolating them from the community and world around them. The Family Support Program is a program that helps individuals with severe disabilities and their families stay together in their homes and communities. It is a critical service that helps preserve the family unit and lessens pressure that may lead to institutionalization, divorce, neglect, and child abuse. About $1M has already been cut from the program in the current fiscal year and there is talk of cutting as much as an additional $2M more, which would be nearly 40% of the budget cut from one of the state’s most successful program. We received positive feedback from all the senators and representatives we spoke with. If you weren’t able to make the trip with us yesterday, it’s not too late for your voice to be heard. You can find your legislator here. We encourage you call, email, or write and let your voice be heard. Check back later for pictures from our trip. Have you ever wanted to really make a difference in somebody's life, but weren't sure where to start? Come see The Arc of the Mid-South on Thursday, February 26, from 4–7 PM at the Oak Court Mall for the 2009 Volunteer Expo presented by Volunteer Mid-South and MPACT Memphis. We'll be just one of several local non-profit organizations showcasing their programs and volunteer opportunities to community members. The event is free and open to the public. Click the image for more details. We will be there signing up new volunteers and getting information into the community about our organization. We will also have representation from our Family Services department available to give information on the 2009 Respite Weekend Retreats and Summer Camp, both of which are excellent volunteer opportunities. If you are interested in volunteering or receiving more information about The Arc of the Mid-South, come on out and join in the fun on Thursday at the Oak Court Mall. See you there! For a complete list of agencies that will be there, click here. In another example of a person with a disability shattering negative stereotypes, this season of The Amazing Race on CBS features Luke Adams, the show’s first contestant who is deaf. Luke has been deaf since birth and has relied on Margie to be his voice to the world. The pair has developed their own shorthand sign language, and hope that their ability to communicate non-verbally will give them something of an advantage as the race wears on. Through two legs, Luke and his mom Margie have emerged as one of the strongest teams on the show. They won the first leg of the race which aired last Sunday, taking home a trip for two to Puerto Vallarta, Mexico, for their efforts. In the episode that aired last night, a cake-covered Luke and Margie arrived at the mat 4th, keeping them in good position to be serious challengers as the race progresses. Luke hopes that his appearance on The Amazing Race will be an inspiration to other individuals who are deaf. From the official The Amazing Race page on CBS.com, Luke says he wants to “be a role-model for deaf people everywhere while proving that the deaf can do just about anything and to never think otherwise”. He’s already won over his competition, as many have expressed that sentiment. Judging by the show's fan page, it appears he’s winning over the public too. Admission is free but please register by calling Megan Long at (901) 507-8568 or emailing her (here) or logging on to the web site (www.epilepsytn.org) and click on EVENTS. Contact Judy Dorris at (866) 650-0500. Exceptional Parent Magazine invites you to participate in a webinar on Special Needs Planning. Join a Merrill Lynch Financial Advisor, a third-party special needs trust attorney, and a representative from a third-party disability organization as they discuss the financial, legal and social challenges faced by families like yours. (Please note that neither Merrill Lynch nor its personnel provide tax, accounting, or legal advice). The webinar is available in two convenient formats: Live, one-way audio/video streamed with e-mail chat or Archived (viewed online after the event). For more information, please click here. Germantown Parks and Recreation offer Special Recreation Activities: Dance lessons taught by the River City Boppers. Pizza, snacks and soft drinks will be served. Special Recreation activities are free for teens and adults with intellectual or physical disabilities and their friends and families. For information, contact Michelle McDonnell at (901) 757-7382 or email her here. Sponsored by: The Harwood Center Inc., Hope Presbyterian Church & The UT Boling Center for Developmental Disabilities. Our celebration of National Developmental Disabilities Awareness Month kicks off next Wednesday as we head to Nashville for the West Tennessee Disability Days on the Hill. Disability Days seeks to empower people with disabilities, their families, and friends, offering a unique opportunity for constituents to connect with their legislators to discuss issues important to their families and the disability community. Our main focus will likely be preserving Tennessee’s Family Support Program. The Family Support Program has endured pretty significant budget cuts and it looks like more may be coming in 2009. This is the only state program that gives money to individuals and family members with disabilities. There is already a notable shortage of services for the disability community in TN. With a small program like Family Support receiving cuts, this does nothing but harm the disability community at large. We would like every legislator to hear from someone in their community. Since not everyone can make the trip to Nashville, we encourage you to reach out to your legislators this month with phone calls, emails, or maybe a personal visit in your hometown. Click here to find your legislator. As a community, the general public must join together to develop and implement public policies that will promote individual worth, self respect, and dignity so that each individual is valued as a contributing member and citizen of its community. 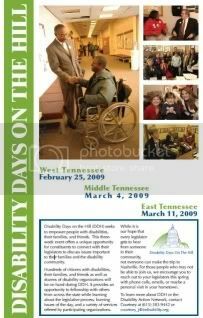 Middle Tennessee Disability Days on the Hill is Wednesday, March 4th, and East Tennessee is Wednesday, March 11th. For more information, please visit the Tennessee Disability Coalition. March is National Developmental Disabilities Awareness Month and to celebrate the month and its importance, The Arc of the Mid-South has put together a series of events open to the general public. Though technically a few days before March begins, Disability Days on the Hill is a key component of the March Madness celebration. The Arc of the Mid-South will be hosting a bus trip to the Capitol in Nashville. This is your chance to speak with legislators about issues important to you and your family. For more information, please contact Megan Long in our Advocacy Department at (901) 507-8568 or mlong -at- arcmidsouth -dot- net. Join The Arc of the Mid-South as we kick off National Developmental Disabilities Awareness Month at Memphis City Hall with the local mayors’ proclamations on display as well as other information about our organization. For more information, please contact Jennifer Buchanan at (901) 327-2473 or jbuchanan -at- arcmidsouth -dot- net. The Arc of the Mid-South's Career Development and Job Placement (CDJP) program will host a three-day job readiness training for students with disabilities. Wednesday and Thursday will feature classes that help prepare the students for everything from the interview process to time management to goal setting. Friday, local employers will be on site to talk with students about available opportunities. Please contact Jennifer Buchanan at (901) 327-2473 or jbuchanan -at- arcmidsouth -dot- net. The 13th annual Wheelchair Basketball Tournament will once again take place at Mississippi Boulevard Christian Church. Teams from city and county government, local businesses, and other Arc supporters will come together to play wheelchair basketball in honor of Developmental Disability Awareness Month. This year, we're also hosting our Information Fair during the basketball tournament. Other organizations in the area that work with those with disabilities will be on site with information about themselves and services they offer. To register a team for the Wheelchair Basketball tournament or to find out more about the Information Fair, please contact Ruth Kirby at (901) 507-8569 or rkirby -at- arcmidsouth -dot- net. This year's Respite Retreats are being held at Nelson Woods Retreat Center. The retreats start on Friday evening (check-in at 7PM) and end on Sunday afternoon (check-out at Noon). Your child/family member will enjoy a variety of activities throughout the weekend. The first Summer Camp (July 11 - 15) of the year is also being held at the Nelson Woods Retreat Center. The second Summer Camp session (July 25 - July 29) will be held at Pinecrest Retreat and Conference Center. If you are interested in registering your child/family member, please call Annette Knox at (901) 327-2473. To effectively continue our mission, we need your support. All donations are tax-deductible. Upon receipt of your donation, you will be sent a letter and receipt for your tax records. We appreciate your support. Through your donation, The Arc Mid-South is able to improve the services and opportunities for individuals with disabilities. Membership is quick and easy just click here to fill out the membership application form. Someone will contact you soon regarding membership request. If you live in the Memphis area, you can volunteer your time by helping us in so many ways. We need volunteers to do teaching, office/clerical work, communications, and much more. Please contact our office at (901) 327-2473 to find out more information out our volunteer program. The Arc Mid-South is a non-profit, United Way agency that is dedicated to empowering people with disabilities and their families to reach their full potential and to enhance their quality of life. Once known as MARC, The Arc Mid-South currently offers a wide variety of programs and services for individuals with disabilities, including autism, cerebral palsy, Down syndrome, muscular dystrophy, etc. The Arc Mid-South is committed to providing advocacy and services which enable individuals with disabilities to realize their uniqueness, worth, and full inclusion in society. The Arc Mid-South's commitment is to all people with disabilities and their families. The Arc Mid-South will actively sow the seeds of information and understanding. The Arc Mid-South affirms the uniqueness and worth in society of all persons and will endeavor to empower individuals and their families.